The treatment of the borrowing of real-world elements in video games depends on the nature of the underlying rights – creating a complicated environment for rights holders to navigate. We provide a breakdown of the UK trademark market – examining how Brexit has affected filing strategies, inspecting brand value trends, and analysing the stellar performance of the UK IP Office. Following a brief interlude for INTA’s Annual Meeting in Seattle, our series of articles providing insights into the work of leading corporate trademark professionals returns this week with insights from Robert Hagelstam. World Trademark Review catches up with Jerry Xia, deputy general counsel and chief IP counsel, Asia Pacific, for Honeywell. He shares his insights into how the Chinese brand protection landscape has developed in recent years, offers some practical tips for managing trademarks in the region. Geographical indications have hit the headlines in recent months, with mainstream debate grappling the extent of their protection – but why have they become such a hot political issue? The Scotch Whisky Association’s director of legal affairs pulls back the curtain to reveal how the industry’s heritage is protected. With the enforcement landscape rapidly evolving, analysis of litigation data provides unique strategic insight into brand protection efforts – and reveals the brands filing the most infringement actions. Examining the apparel sector, we show that the leading brands have remained robust, analyse how filing patterns have changed, and reveal that Chinese brands have failed to make the cut in the list of the world’s leading fashion brands. While the GDPR entered into force on 25 May, the provisional model adopted by ICANN to bring the WHOIS database into compliance is a compromise that does not seem to meet the strict requirements of the new European regulation or answer the needs of IP practitioners. With Africa proving particularly vulnerable to the sale of counterfeit goods, we take a look at some of the problems and solutions from a wide swathe of nations across the continent. With licensing now a $100 billion industry, it has become a very attractive and widely used business tool, but companies seeking to leverage brand awareness, build brand equity and drive new revenues need to stay on top of the latest market trends in order to succeed. On 22 May 2018 World Trademark Review announced the winners of its 12th Industry Awards at an exclusive ceremony at the Seattle Art Museum. The awards are designed to recognise the vital work carried out by in-house trademark counsel and to identify the teams and individuals that are performing their functions to the highest possible standards. 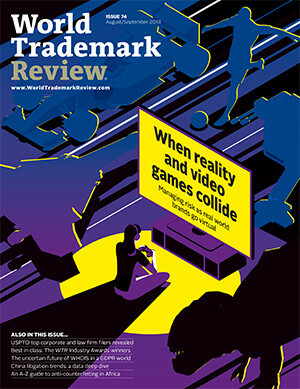 Is the trademark litigation slump over? One factor which is frequently associated with mental health issues is work-related stress, something with which professionals in the IP industry are familiar. We look at how best to recognise and address this issue. Regionality is a well-known characteristic of trademark protection and brings particular jurisdictional challenges for fashion and luxury brands. In China, these challenges include trademark squatting and parallel imports. While luxury brands are increasingly entering the Indian market, proving India’s potential as a destination for luxury products, they face some formidable challenges, including high import duties, lack of quality retail space and the ever-present threat of counterfeiting. Some so-called ‘legal fakes’ in Italy have so successfully fooled consumers and won over luxury and fashion brand fans that they have essentially supplanted the original brands, which are yet to conquer the country. Innovation, notoriety, protective registration and counterfeiting are key challenges for fashion and luxury brands. Fortunately, Mexico has a complex system of enforcement in place. Anti-counterfeiting measures will never succeed in removing all counterfeits from the market, but they do make it significantly more difficult for counterfeiters to produce and sell fakes. Turkey is a tourist hot spot – but as the visitor numbers escalate, so too do the fake products. A good brand protection strategy can help to reduce the visibility of counterfeit products riding on the coattails of a trademark. A pending US district court case on a fashion company’s efforts to protect a handbag design as a non-traditional trademark under US law – even though variations of the design have long been in the public domain – should provide much-needed clarity on this area.